Visual Studio Code>Themes>Sapphire ThemeNew to Visual Studio Code? Get it now. Sapphire is a vibrant blue theme for Visual Studio Code, created with the help of vscode-theme-generator. 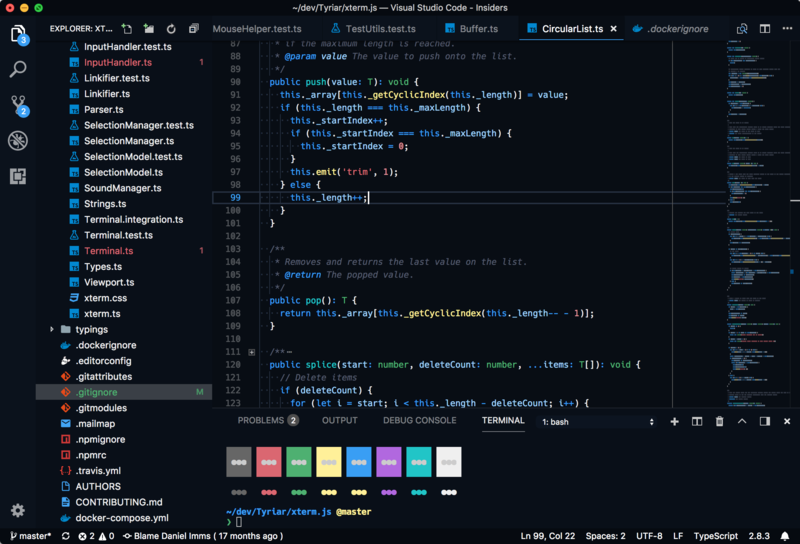 This theme customizes colors in the editor, workbench and integrated terminal. Colors in Sapphire have strong meaning. If you see any inconsistencies with the colors please report them to the GitHub repo. Sapphire attempts to make selections more clear by giving them distinct colors which stack upon each other nicely. Word highlight is used when the cursor is places over a word/symbol that the language extension recognizes, all other occurrences of the symbol are also highlighted. It's colored using a transparent white. Selection highlight is blue. Other occurrences of the selection text are also highlighted with a slightly brighter blue. Find highlight is used for all matches of find in file (ctrl/cmd+f) and find in files (ctrl/cmd+shift+f). It's colored in red with the active find selection bring brighter than the others and also having a background highlight. The theme also includes a dim and a bright variant.